This is not Harry Potter and his stones, goblets, or phoenix or his 500+ pages of "Oh my God, are those words?!?!?" Also, this is not Sherlock Holmes and his fun loving pal, Watson, either with their "Oh, Lord! Is that English?!?!?" You don't have to faint yet; I would never subject non-bibliophiles (a.k.a. book geeks, Scrabble players, word fiends, nerds) to those books at the get go. 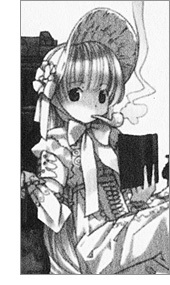 Gosick is technically not a manga though you'll probably find it in that section. It's got a lot more words and a lot less artwork but don't count it out just yet simply because you have a short attention span and you want your eye candy. 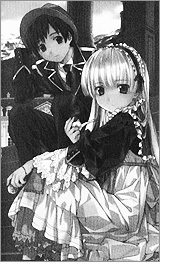 If you've never read anything bigger than a manga or a magazine, Gosick is a great light novel to start with. It has the mystery and suspense of Sherlock Holmes wrapped up in a sweet candy coated shell of our main characters, Victorique and Kazuya. Normally, Victorique and Kazuya are stuck in their private ultra-elite school, Saint Marguerite Academy, but Kazuya was able to ...ummm... negotiate a day away from school out of the town's lead detective for both of them. Technically, he blackmailed him by threatening to tell everyone that Victorique solved the case but let's not dwell on the small things. In any case, since they were able to get out and the detective ended up being too busy to keep an eye on them, they decided to take a dead woman's invitation to go on a luxury cruise. The ship's name kept bothering him though: The Queen Berry. Victorique doesn't care; she just wants to know who would invite a dead woman to a cruise. They're both bored and they would only get more bored sitting around waiting for their babysitter to come back so off to a luxury cruise they go. Once they got on the boat and set sail, Kazuya's memory comes back. The Queen Berry sank ten years ago; they are on a ghost ship! Horror stories about this ghost ship have been floating all around school since the day Kazuya started. Classmates have said that people have been killed on that ship but when police were sent to investigate, no bodies were found. The entire ship was booby-trapped but before the police can make sense of anything, the ship started taking in water and sank. No one knows how many people were on the original Queen Berry the first time but this time, there's twelve people and all twelve are going to die unless Victorique can piece together all of the chaos around her into the truth of what is happening to them. Even if Victorique can piece everything together, Kazuya has to keep both of them alive long enough for them to get off the ship and tell the authorities. As the third son of an Imperial soldier of Japan, Kazuya has always lived in the shadow of his father and his brothers, questioning if he will ever have enough strength and muster to protect anyone. 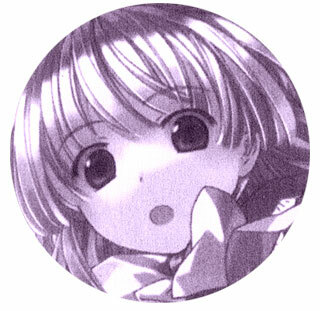 His job is not that much easier considering Victorique seems to be an itty-bitty porcelain doll of a girl. Small for her age and hidden from the outside world by her family since birth, Victorique is physically and emotionally as small and fragile as her brain is huge and complex. It's a little strange that a tiny girl like her smokes a pipe, too. Rumor has it that her mother is nuts and her family is deathly afraid of her as well. 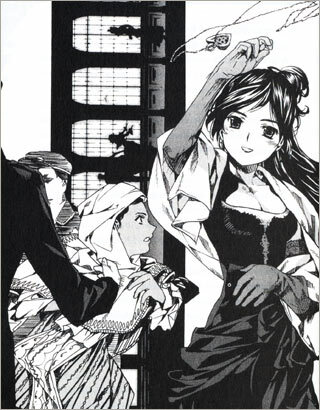 Something short and light in weight, Gosick is a perfect read for you beginners out there. You really should start using something called your imagination; take it for a spin and maybe you'll get something better than eye candy. Reading may grow on you and you'll graduate to something that has no artwork with a crazy amount of words in them. 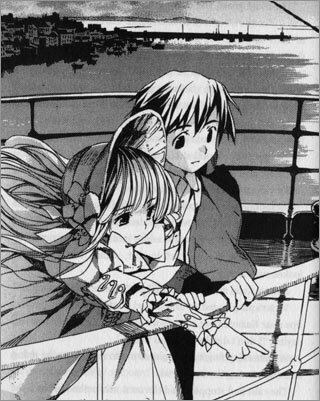 Below: An illustration from the light novel Gosick. 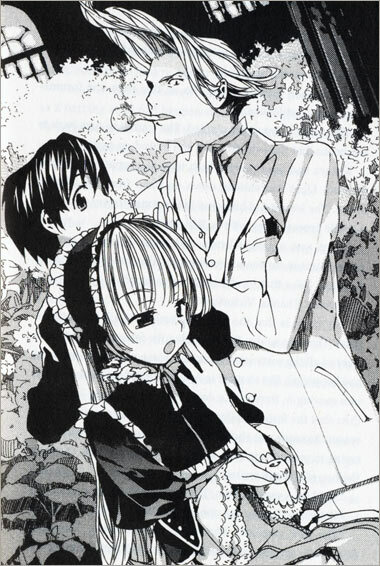 Below: Illustrations from the light novel Gosick.